Stoke-by-Nayland Church is in the Stour Valley, Suffolk, in the heart of Constable country. 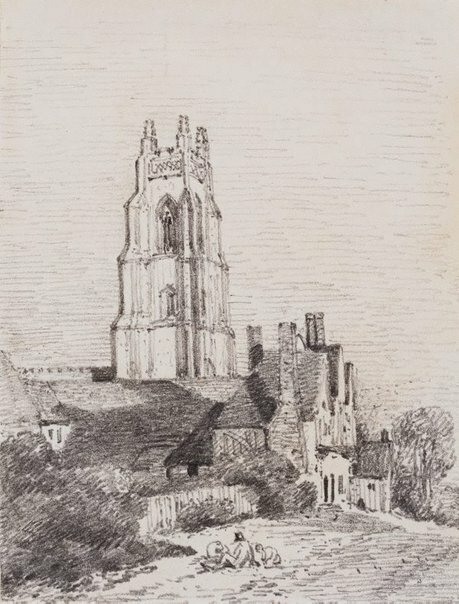 The church was a favourite of the artist’s and appears in a number of his paintings and drawings, such as the oil, ‘Stoke-by-Nayland’ (1836) in the Art Institute of Chicago. The Scharf drawing is almost identical to the sketch on page 21 of Constable’s sketchbook, used between July and November 1814 (Victoria and Albert Museum). It seems probable that our drawing was worked up from the rougher sketchbook version at a slightly later time. Prints & drawings Europe 1500-1900 , Sydney, 2014, p 116, col illus p 117.